Summary A very powerful gas pressure washer for homeowners. Almost at a commercial washer level. If you are looking to purchase a pressure washer for home use, you may be considering the Simpson MSH3125-S 1100, and wondering how to decide between it and other washers. Good News! We've done the homework for you, and present here a thorough review of this pressure washer, to help you make the best choice. 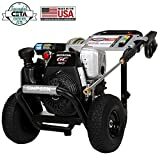 The MSH3125-S 1100 is a best-seller among gas-powered pressure washers on Amazon, with over 600 reviews (67% 5 stars) and an average rating of 4.4 out of 5 stars. In terms of flow rate and pressure, it is solidly in the middle of the under $500 pack, delivering 2.5 GPM at 3100 PSI, and including nozzles to adjust the focus of the flow, as well as one for applying detergent. There are two important components to a pressure washer: the engine and the pump. It is important to look for quality in both, since if either one is of low quality, the washer will not last long or perform well. One thing that sets this washer apart from the others is the Honda engine. Honda engines are known for being reliable, easy to start, and fuel efficient. Both homeowners and professionals consider them to be their first choice for 4-stroke engines. This particular Honda model is a GC190 OHC horizontal shaft, 4-stroke engine. For pressure washers, horizontal shaft engines are generally considered to last longer than those with vertical shafts. The engine is 187cc, with an overhead cam and overhead valve design. It delivers 5.2 HP @ 3600 RPM, which should be sufficient for any non-professional's needs. The ignition system is a transistorized magneto type with a recoil/electric (pull operated) starting system. The gas tank holds 1.9 U.S. quarts (1.8 liters), and uses 86+ octane unleaded gas (avoid ethanol - more on this later). This engine meets EPA and CARB emission standards. The MSH3125-S features an Axial Cam Pump from OEM Technologies. It features PowerBoost technology for better cleaning performance, precision-ground and polished stainless steel pistons, a brass head for durability, and an oil bath lubrication system that is maintenance free. It also features a thermal relief system which prevents overheating. The high-efficiency design of the pump minimized the load on the engine while still providing 3100 PSI at 2.5 GPM. Axial cam pumps are a notch above so-called 'wobble pumps', which are often found on entry-level pressure washers, and are much more reliable and powerful. The high-pressure hose is flexible, abrasion and kink resistant, and non-marring (meaning it won't leave black marks on everything it touches, like some hoses). It is often recommended to run a small engine dry before storing to avoid fuel left in the lines becoming gummy and clogging the fuel delivery system. A gas shut off valve can make it possible to do this without emptying the gas tank. Unfortunately, this PW does not have a gas shut off valve. To avoid wasting fuel, if there is excess gas in the tank when it is time to store the washer for a long period, the extra fuel can be siphoned off and then the engine can be run dry. Alternatively, a gasoline stabilizer (such as Sta-Bil) can be added to the fuel to enable longer storage. This PW cannot draw from a standing water source - to provide the advertised pressure, it requires being hooked up to a garden hose or other pressured water system. Typical household pressure is sufficient. The PW does not come with a hose to connect it to the water source, but a garden hose attached to a sillcock works fine. While the pump has a system to prevent overheating, the engine does not have a low oil alert. The oil tank holds 20 ounces of oil, so as long as there is no serious leak and the level is checked on a regular basis, this should not be a problem. NOTE: The PW comes with only 16 ounces of oil, but the engine is tested before shipment, meaning that there is some oil already in the system, so only 16 ounces needs to be added after purchase. Some reviewers reported that parts were missing from their PW when it was delivered, and that they found Simpson customer service to be a disappointment. 90 Days on spray accessory items. For washers purchased online, warranty repairs are handled by local shops approved by the Simpson company. Some reviewers reported that their local shop was unwilling to work on their Simpson PW on a warranty basis because they have difficulty getting reimbursed by the company. An extension wand (needed to reach a second house story) and/or longer hose can be used with this washer. One reviewer said he has used it with a 50-foot hose. Keep in mind, however, that this washer comes with a 1/4" hose, while other washers often use 3/8". Some reviewers did report using a 3/8" or even 5/8" hose with this washer. Obviously, the connectors would have to be the right size. One reviewer mentioned that he replaced the standard 14" x 25' hose with a longer one, and added swivel connectors at either end. He reported that this made maneuvering the washer nozzle much easier. Downstream detergent delivery makes it easy to add detergent to the pressurized stream (special nozzle required, which comes with the unit), and means that the detergent does not pass through the pump. The pump is thus protected from damage by cleaning chemicals. This power washer does not come with a tank to hold detergent, but the included detergent siphon hose can easily draw directly from a bottle of detergent mix, so this should not be a concern. The 4 different nozzles (0°, 15°, 25°, 40°) allow you to control the intensity of the stream. Caution should be used with wood siding - the very narrow nozzle can damage the wood and leave grooves in it. Always start with the wider nozzle and work downwards to find the optimal width. The included wand can spray at a distance of about 15 feet. A ladder can extend this range, but for second stories of houses, an extension wand is recommended and can be easily obtained online or from a big box retailer like Home Depot or Lowe's. For large surfaces like driveways, it may be best to get a surface cleaner attachment in addition to the included nozzles. The PW has onboard storage for the spray gun/wand, the high-pressure hose, and the nozzles, so you can keep everything together neat and tidy when storing. NOTE: Some users reported that the vibration of the engine and pump caused the nozzles to fall out, so it may be best to remove them while using the washer. The pump should be filled with pump antifreeze for winter storage in areas where the temperature drops below 32 F / 0 C.
This PW uses 89+ octane unleaded gasoline. Ethanol should be entirely avoided if possible, as it tends to clog the carburetor. If you live in an area, such as California, where all the available gasoline contains ethanol, use an ethanol shield additive to avoid this problem. 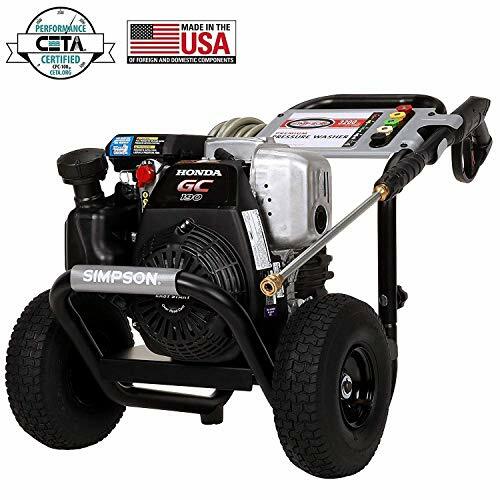 The Simpson MSH3125-S Pressure Washer is a versatile machine that has a high-quality Honda engine and a pump with good features. It is a good choice for consumer use, but probably not appropriate for commercial use. It comes complete with everything you need to operate it, except the gas (it takes 89+ octane unleaded) and a hose to connect to the water supply (a garden hose is perfectly adequate). Every unit is tested before shipment, so there may be some fuel odor when unpacking. While some who purchased their units online reported difficulty obtaining warranty service, the large proportion of positive reviews on Amazon (84% 4 stars or above) indicates that there are a lot of very satisfied users of this machine.